A day tour that will excite your senses! Take the scenic route along Port Phillip Bay to Mornington for a refreshment stop (own expense). Continue along the bay and inland to The Cups Estate for wine tasting. 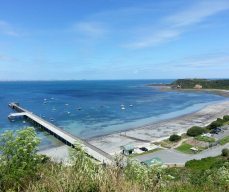 Tour through the small township of Flinders, enjoy a chocolate tasting, bakery cafe lunch, photo stop at the lookout for panoramic views towards Phillip Island and scenic drive through Flinders golf course. Cider, produce and cheese tasting awaits at Mock Red Hill and it's then time to pick your own delicious strawberries at Sunny Ridge! Arthurs Seat - panoramic views from Murrays Lookout across the bay to the CBD (photo stop).